Since I've been buying pasture raised turkeys from local small family farms, I always make turkey bone broth, because I am determined to use the entire turkey and not waste any of it. 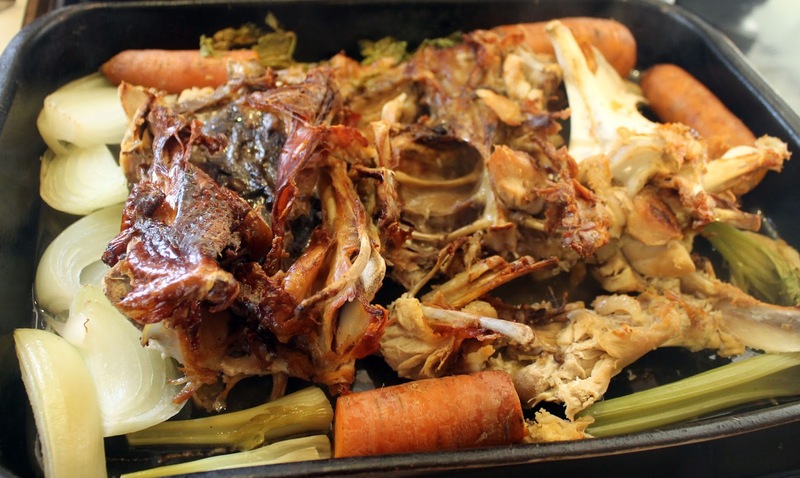 Turkey Bone Broth is made with the turkey carcass which contains a small amount of meat adhering to the bones. As with any stock, the bones are roasted first to improve the flavor of the bone broth. 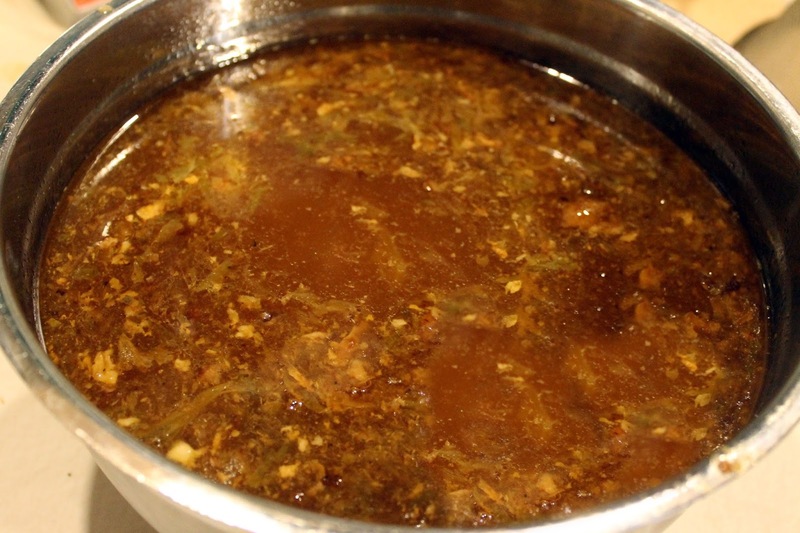 Bone broths are simmered for a very long period of time. This long cooking time helps to remove as many minerals and nutrients as possible from the bones. Preheat oven to 300. Roast carcass in a large roasting pan at least one hour (I put mine in the oven right from the freezer). Remove from oven. Place carcass, water, vinegar, celery, carrots, onion, bay leaves, garlic, salt and pepper in a large slow cooker. Cover and cook on low up to 48 hours adding more water as necessary to cover the carcass, however, there will be some reduction as it cooks down. Remove carcass from broth and strain broth through a mesh colander, removing solids (the carcass will be falling apart). Allow broth to cool in the refrigerator until fat rises to the top. Remove fat which has solidified and discard. 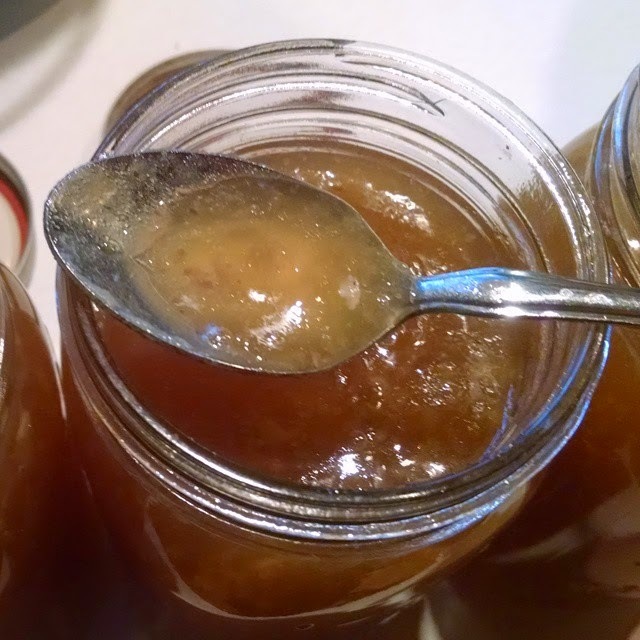 Freeze or pressure can turkey bone broth. 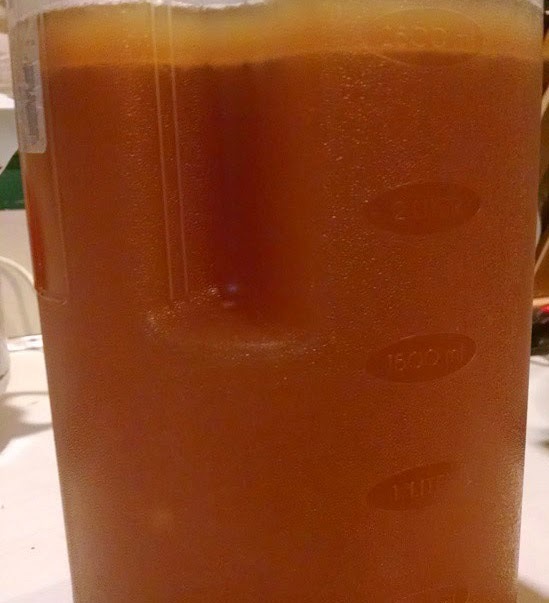 Pressure canning: Fill pint or quart canning jars leaving a 1-inch head-space. Process pints 20 minutes and quarts 25 minutes at 11 lbs. pressure. 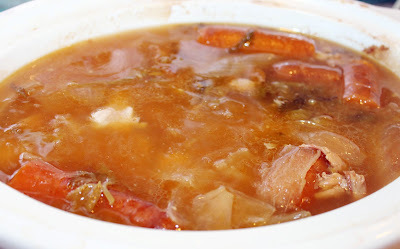 Uses: anytime a recipe calls for turkey stock, use the turkey bone broth. 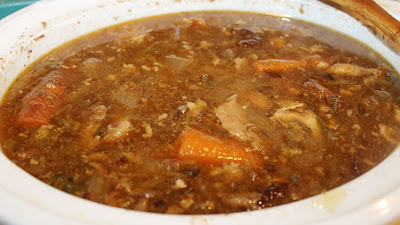 Use it as a turkey base in soups, gravies, stews, sauces, and reductions. It can also be used to saute or roast vegetables, steam rice or add to mashed potatoes instead of water for great flavor. 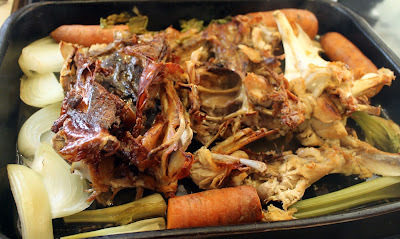 Cook's note - the bone broth will be gelatinous and look much like turkey jello, which is completely normal. It will thin out and become liquid again once heated.